Featuring a solid pewter frame and locket, this is the perfect combination when you want to save just a bit of your pet's ashes after scattering or want to have just a bit of your pet's ashes by you on your work desktop, night table or bureau. 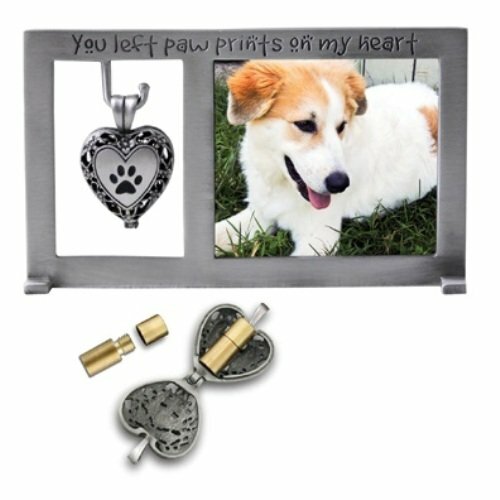 The inscription "You left paw prints on my heart" can be read on the top of the frame which contains your pet's favorite photo measuring 2 1/2" wide by 2 1/2" high. 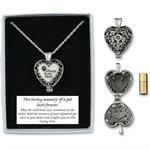 Hanging on the side of the photo is a paw print graced heart shaped locket which contains the brass vial that securely holds your pet's ashes. Whenever you want to keep your pet close, simply slip the heart off the hook and slide onto your favorite chain to wear as a pendant.